These champignons are particularly tasty, scented and white thanks to the aseptic process. 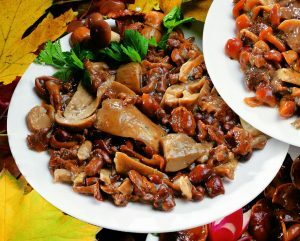 Cultivated field mushrooms (Agaricus Bisporus), sunflower seed oil, salt and kitchen herbs. Ideal as a side dish with meat, on pizzas, canapé and in sandwiches. Six varieties of mushrooms: five of which are wild (Shoestring mushrooms – Armillaria mellea, porcini mushrooms – Boletus edulis, chanterelles – Cantharellus, sanguinello mushrooms – Lactarius deliciosus, and pinaroli mushrooms) and one of which is cultivated (Pholiota mutabilis). 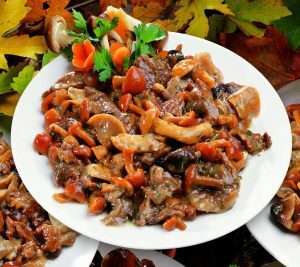 A perfectly balanced mixture of large mushroom pieces with different seasonings, colors, and tastes, prepared with garlic and herbs and packed in oil. Ideal as a side dish, for hors d’oeuvres, in sandwiches and canapés and on pizzas. 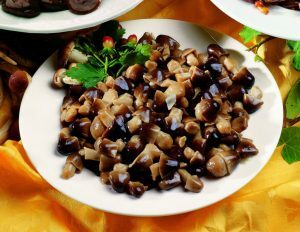 Very small cultivated mushrooms prepared with a small amount of vinegar and packed in olive oil and sunflower oil. Very good for hors d’oeuvres, sandwiches, and canapés. Chanterelles with their characteristic fruity flavor, packed in brine. 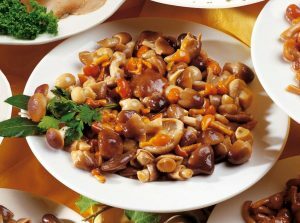 Ideal for risottos, pasta dishes, side dishes, mixed mushrooms, and with polenta.